“We live in a world in which we need to share responsibility. Then there are those who see the need and respond. 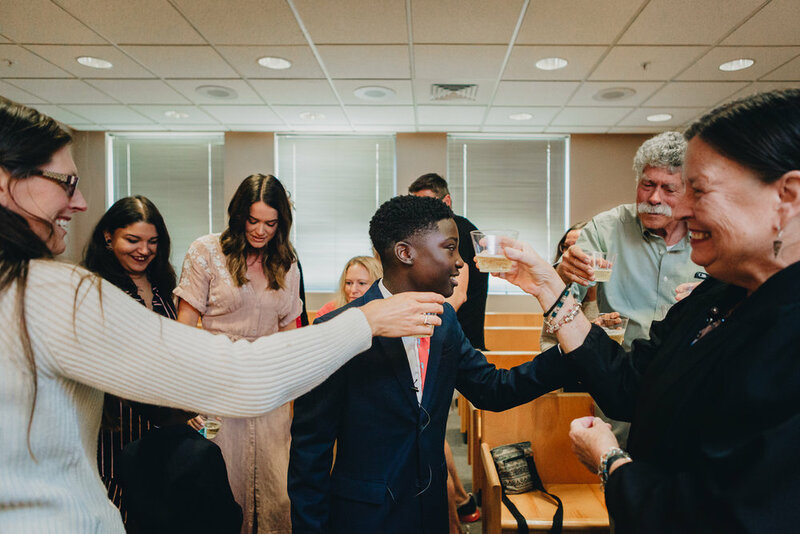 I can't think of a better way to kick off any work week than the way I was lucky enough to start mine: by photographing the long-awaited adoption of two awesome boys by some of my former wedding clients. This stellar couple began fostering children not long after their wedding 4 years ago, and I am in total awe of their journey. Children's issues are so dear to my heart, and this family is a shining example of the beauty and hard work that foster parenting can encompass. The family's official adoption date was bright and early on Monday morning, and the soon-to-be official parents made the day's festivities so special for their boys. They surprised them with a limo ride to the courthouse (minds were blown!) where they were joined by family and friends. After the adoption hearing, they celebrated in the best way possible: by heading to the donut shop and letting the boys eat whichever donut they wanted. (This photographer also thoroughly enjoyed her delicious maple bar.) Bellingham, your donut game is strong. Hey, when in Rome! Celebratory donuts and sparkling cider aside, the love in the courtroom that morning was palpable, especially after their oldest boy made a sweet, impromptu speech about how thrilled he was to finally (officially) be able to claim these folks as his parents. Not a dry eye in the house, man. This family is an inspiration. Words don't do them justice. Let me attempt to give you a feeling for their amazingness through photos, instead. Click the play button below for some musical accompaniment as you scroll.